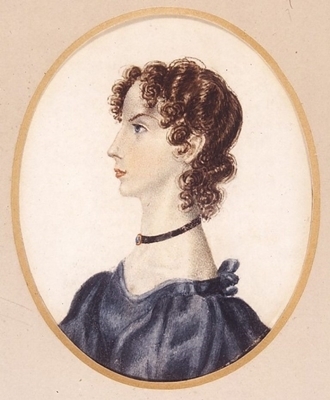 LEFT: Assumed to be Emily Bronte c1834 in a tracing from the 'Gun Group' portrait. CENTRE: Undisputed portrait of Emily Bronte c1833 in the 'Pillar Portrait,' painted by her teenage brother, Branwell; she would be about 15 years old. 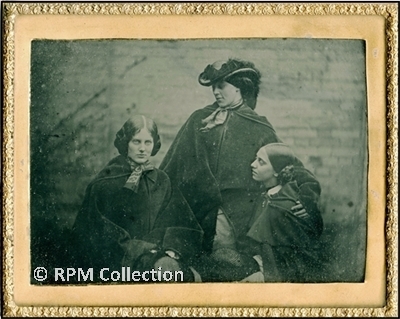 RIGHT: 'Emily' in the Photograph; if this is Emily Bronte and the photo was taken c1848 she would be about 30 years old. It has long been a mystery as to why Charlotte's portraits of Anne have survived but none of Emily. 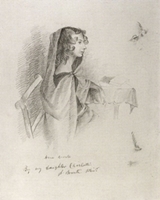 The Pencil sketch of Anne Bronte by Charlotte. 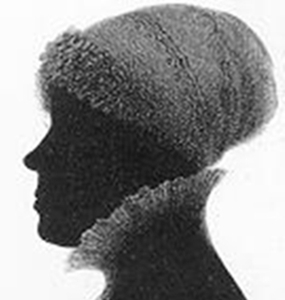 Martha Brown owned two pencil sketches by Charlotte, one of Anne and one of Emily. These were seen by William Robertson Nicoll when he visited her in 1879. "Martha Brown possessed a very clearly and boldly drawn pencil sketch of Emily by Charlotte, which I in vain endeavoured to purchase." 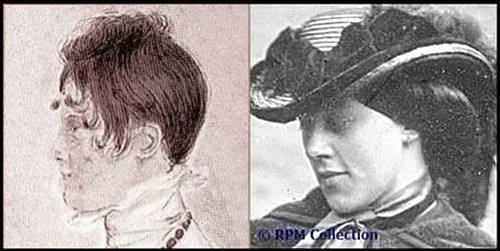 After Martha's death in January 1880 he purchased the sketch of Anne from one of her sisters but could not trace the one of Emily. This portrait of Anne appears on p.230 of Art of the Brontes, it is a miniature oval watercolour, by Charlotte. Does one exist of Emily? The miniature oval watercolour of Anne Bronte by Charlotte. There is one unidentified watercolour portrait by Charlotte, the portrait seen below of an unknown woman. It is a miniature oval watercolour created in the same period as the one of her sister Anne. Detail of the image is shown here, reversed for comparison with the photo. The full portrait can be found on p.231 of Art of the Brontes where it is suggested that she could be the Bronte Sisters' Aunt Elizabeth Branwell. 1. Descriptions of Emily by people who actually knew or met her are few but physical and mental strength is a recurring theme. “Stronger than a man, simpler than a child, her nature stood alone." "She should have been a man—a great navigator..... She had a head for logic, and a capability of argument unusual in a man and rarer indeed in a woman...impairing this gift was her stubborn tenacity of will which rendered her obtuse to all reasoning where her own wishes, or her own sense of right, was concerned." Martha Brown quoted in Mary Robinson's Emily Bronte. "I simply disliked her from the first, her tallish, ungainly, ill-dressed figure contrasting so strangely with Charlotte's small, neat, trim person, although their dresses were alike." Laetitia Wheelwright, pupil at the Pensionnat Heger, quoted in 1896. "Emily was the tallest. She'd bigger bones and was stronger looking and more masculine, but very nice in her ways." ‘Old Haworth Folk Who Knew The Brontes’ The Cornhill Magazine, New Series, vol. xxix. July to December 1910 London, Smith, Elder, & Co.
"Patrick 'had such unbounded confidence in his daughter Emily, knowing, as he did her unparalleled intrepidity and firmness, that he resolved to learn her to shoot too. They used to practice with pistols." John Greenwood quoting Patrick Bronte. 3a. Probably the most important clue as to Emily's appearance can be found in a letter by Charlotte concerning the art critic, George Henry Lewes (1817-1878) whose "face almost moves me to tears—it is so wonderfully like Emily—her eyes, her features - the very nose, the somewhat prominent mouth, the forehead-even at moments the expression." Charlotte met George Henry Lewes in 1850 when he was 33 years old. The 'Emily' in the photo is here compared with Lewes as a 23-year-old in 1840 and three undated photos c1865-78. The Branwell Family of Penzance, Cornwall. 'Emily' in the photo bears no resemblance to Emily's father Patrick Bronte but does have features associated with her mother's side of the family. Emily's grandmother and mother Maria whose family were the Branwell's from Penzance. Photographs exist of Maria's first-cousins who lived in Penzance in the 1880s. This branch of the family lived at Penlee House, Penzance, now a museum for West Cornwall. The museum website has portraits and photographs of the Branwell family and a prominent chin and jaw are recurring features. 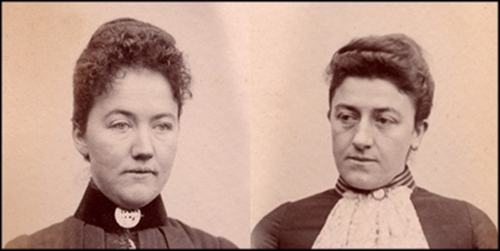 Photos of Edith and Marion Branwell. The Carne Family of Penzance, Cornwall. Elizabeth Carne (1817-1873) of Penzance, Cornwall was a second cousin of the Bronte sisters on the maternal side of the family. She was a geologist, author and philanthropist. Her first publication came in 1860: 'Three Months' Rest at Pau in the Winter and Spring of 1859’ under the pseudonym of John Altrayd Wittitterly.4. Her father was the geologist Joseph Carne (1782-1858). Joseph's brother, John Carne (1789-1844) was also an author and travel writer. Reading the small amount of surviving evidence, Emily appears to have been in good health throughout the 1840s, until 1848. In 1841 she wrote that "We are all stout and hearty" and she was fit enough to make the long journey to Brussels with Charlotte in February 1842. She was well during most of their nine months in Belgium. They returned to England in November 1842, and in a letter to Ellen Nussey in May 1843, all at the Parsonage were "in good health" and "so was Anne according to the last accounts." "I am quite contented for myself – not as idle as formerly, altogether as hearty and having learnt to make the most of the present and hope for the future with less fidgetiness that I cannot do all I wish – seldom or ever troubled with nothing to do, and merely desiring that every body could be as comfortable as myself and as undesponding and then we should have a very tolerable world of it...I must hurry off now to my taming and ironing I have plenty of work on hands and writing and am altogether full of business." Martha Brown stated that the sisters "were all well when Mr. Branwell was buried; but Miss Emily broke down the next week." 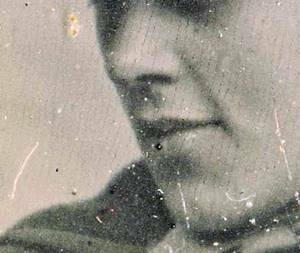 Emily is thought to have had prominent upper teeth; this image shows detail from the photograph.5. 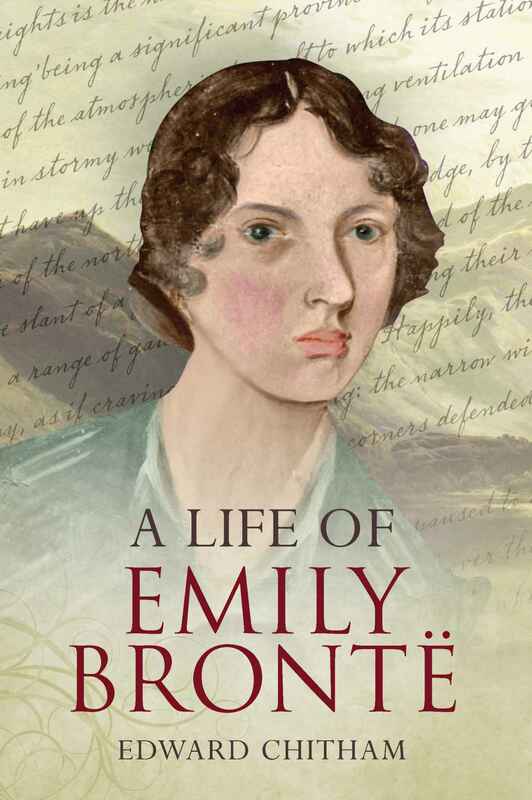 The only undisputed portrait of Emily Bronte is rarely separated from the 'Pillar' portrait group and used as an illustration but a slightly modified version did appear on the cover of Edward Chitham's A Life of Emily Bronte published in 2010. 1. Alexander and Sellars, The Art of the Brontës, p.231. 2. "Emily Brontë [aged about 15 years-old] had by this time acquired a lithesome, graceful figure. She was the tallest person in the house, except her father. Her hair, which was naturally as beautiful as Charlotte's, was in the same unbecoming tight curl and frizz, and there was the same want of complexion. She had very beautiful eyes – kind, kindling, liquid eyes; but she did not often look at you; she was too reserved. Their colour might be said to be dark grey, at other times dark blue, they varied so. She talked very little. 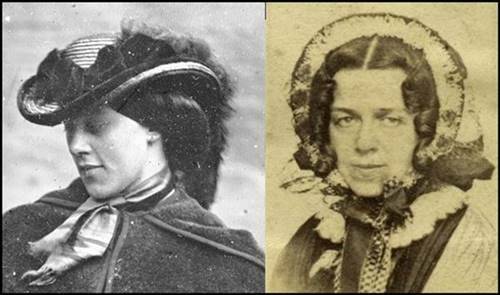 She and Anne were like twins – inseparable companions, and in the very closest sympathy, which never had any interruption. Anne—dear, gentle Anne—was quite different in appearance from the others." Reminiscences of Charlotte Brontë. Ellen Nussey. Scribner's Monthly, an illustrated magazine for the people Volume 2 Issue 1 (May 1871) Click here for the ebook (external website). 3a. In 'Letters, Diary and Documents of John Greenwood Belonging to Mrs Mary Preston, Haworth, Yorkshire,' quoted in Man of Sorrow: Life, Letters and Times of the Reverend Patrick Bronte, 1777-1861, p. 369-370. Patrick 'had such unbounded confidence in his daughter Emily, knowing, as he did her unparalleled intrepidity and firmness, that he resolved to learn her to shoot too. They used to practice with pistols. Let her be ever so busy in her domestic duties, whether in the kitchen baking bread, at which she had such [a] dainty hand, or at her ironing, or at her studies, wrapt in a world of her own creating - it mattered not; if he called upon her to take a lesson, she would put all down. His tender and affectionate "Now, my dear girl, let me see how well you can shoot today," was irresistible to her filial nature, and her most winning and musical voice would be heard to sing through the house in response "Yes, papa!" and away she would run with such a hearty goodwill, taking the board from him and tripping like a fairy down to the bottom of the garden, putting it in its proper position, then returning to her dear, revered parent, take the pistol, which he had previously primed and loaded for her. "Now, my girl," he would say, "take time, be steady". "Yes, papa", she would say, taking the weapon with as firm hand and as steady an eye as any veteran of the camp and fire. Then she would run to fetch the board for him to see how she had succeeded. And she did get so proficient, that she was rarely far from the mark. His 'how cleverly you have done, my dear girl!" was all she cared for. She knew she had gratified him and she would return the pistol, saying, "Load again, papa!" and away she would go into the kitchen, roll another shelf-full of teacakes, then, wiping her hands, she would return again to the garden and call out, "I'm ready again, papa," and so they would go on until he thought she had had enough practice for that day. 4. John Stewart lived in Pau, France and visited Haworth Parsonage in 1856 and 1857. He knew Charlotte's publisher, George Smith but there is no known connection with Elizabeth Carne. 5. "Emily was wont to sit bolt upright in the corner of the pew, as motionless as a statue. Her compressed mouth and drooping eyelids and indeed her whole demeanour appeared to indicate strong innate power. A large protruding tooth added to her peculiar aspect." Extract from a newspaper article "
Bradford Observer 17 April 1894 published in "Strange world of the Brontës" page 34. "Questioned as to whether she could recall Emily Bronte, she remembered her only in this light; she could not think of her individually but associated her with Anne, the two sisters, she declared, being always together. One of them, she could not say which, had very prominent "front teeth." I suggested this would probably be Anne judging by the protrusion of the upper lip in Anne's portrait, but she could not confirm my supposition. She added that she remembered Emily and Anne as being distinctly taller than Charlotte, which, of course, is no new information." Evening Transcript 9 June 1915; Interview with Mrs Wadsworth, aged 80 years, one of Charlotte Bronte's Sunday School scholars.